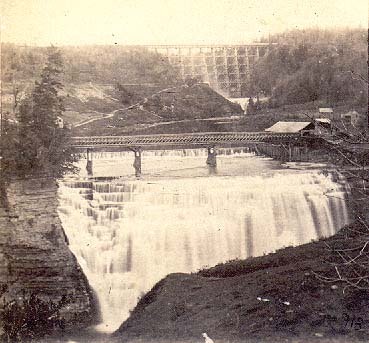 "No 913 The Bridge and Falls at Portage on the Genessee." E& H.T. Anthony & Co. This early image of the Middle Falls area details the "Lattice Bridge." This bridge carried a "public highway" from the Canal towpath to the road system on the west side of the Middle Falls. The Portage Wooden Bridge is seen in the background. Halfway up the side of the Valley to the left of the bridge is a thin horizonal white line, marking the Genesee Valley Canal. As the Canal approaches the Bridge, you will note that road comes down from the Canal toward the Middle Falls. This is the road that crossed over the bridge. According to Mrs. Anderson, the Lattice Bridge was built in 1841 during the construction of the Canal. It was carried out by a flood around 1864 or 65. In the river bed under the Lattice Bridge you will see a low manmade mill dam which served the mills on the west bank. The main mills shown in Photo 1 were destroyed by fire in 1858, leaving the structures shown here.